The rest of the morning passed uneventfully, except for Kasumi kicking Usagi in her sleep, and Kuroda scaring them all — by looking dead — until Genma pointed out that the Vice-commander was known for sleeping with his eyes open. As planned, they struck out for the surface just before midday. Raidou kept an eye on Genma, who kept an eye on Kuroda. Sleep had done them both good: there was color in Genma’s face again, and Kuroda moved with reasonable ease despite his sling. As before, Fukuda took point. This time flanked by Kakashi and Satomi, with Kurenai close behind to buffer the three razor personalities as needed. It didn’t escape Raidou that Team Thirteen’s commanding officers were sticking a lot closer to their rookies. Or that Ryouma was shadowing Genma’s footsteps and carefully giving Kakashi space. Raidou trusted that time and distraction would settle them all back down. The first breath of outside air was sticky, humid, and smelled like wet dirt. Daylight followed shortly after, as the tunnel curved up and out to an entrance hidden in a bleached thicket of dead trees. “It’s hot,” Abe said, surprised. “They’re less common in marshes,” Genma said, with a trace less irony than Usagi. Raidou could understand the confusion. Kiri conjured images of salt-blasted cliffs and frozen mist, not lush wetlands and — he slapped the side of his neck — mosquitos. But they were far south and east of Konoha, and several hours inland from the coast. And, as Usagi had said, it was summer. “Watch out for biting turtles,” he advised. Ryouma and Kasumi gave the nearby reeds a wary look. Ginta was already on high alert, blue eyes scanning distant trees — for shinobi and traps, Raidou presumed, rather than cantankerous fauna. Kuroda made an impatient sound. Fukuda glanced at him, eyes faintly narrowed, then turned east, forging a path out of the grove. With varying degrees of caution, the Konoha ninja followed her. As an experience, Sugizawa Marsh was mostly wet and bug-filled. The silty water started at shin-height, but hidden sinkholes dunked more than one of them unexpectedly up to the armpits before they resorted to chakra-walking. Swarms of tiny black insects targeted any open skin. Trapped under low cloud-cover, heat and humidity clung like bath water. “I’m starting to miss the caves,” Raidou murmured in Genma’s ear, after a particularly foul-smelling branch smacked him in the head. “Next team training,” Raidou promised him. “I’m not missing it that much,” Genma said hastily. The next few hours passed in a sweaty haze of slip-sliding and mud, until they reached a broad sweep of brown water dappled with floating mossy plants. Fukuda paused at the edge. Next to her, Kakashi balanced on the low, bone-white limb of a dead tree. “What do you smell?” Fukuda responded, never taking her eyes off the water. “What’s the hold up?” Kuroda demanded. “We need to go around this stretch,” Fukuda said. Raidou glanced over the water. It was placid as a lake, and utterly silent. There was no birdsong. “Oh gross,” Abe muttered, to one side. He peeled a long brown leech off the side of his arm, unleashing a thin red trickle. The water’s surface trembled. A slimy, undulating shape, as thick around as Raidou’s thigh, broke the surface. It arched like a cobra and turned an eyeless head towards them. Rings of ivory teeth formed concentric circles around its open mouth. Giant leech, Raidou thought. Okay. “We can take that,” Kasumi said scornfully. A thin, inhuman sound crawled up the air, like a fingernail scraping over glass. The lake’s surface boiled with rising shapes. Usagi grabbed Abe by the back of his shirt and hauled him back. Barely feet away, more leeches rose, focused on the group of blood-containing prey, and charged. The leeches kept coming, churning the silty water up so it was impossible to tell where leech bodies ended and muddy ripples began. Kurenai had a slender knife in hand; she slashed one of the pink-brown leeches as it veered towards Fukuda, forcing it away. Another one rose in its place, showing a spiraling array of v-notched yellow teeth leading into its massive gullet, where even larger teeth filled the throat. It writhed blindly in the air, questing for its prey. A larger one, thick as a shrine post, surged out of the water so close to Kuroda that the vice-commander stumbled. Raidou caught him with one hand, while Genma hurled senbon at the beast. Their razor-sharp tips barely penetrated the leathery-looking skin before they fell away, pattering uselessly into the water. This was not a fight they could win on the leeches’ turf. If they could win it at all. Genma sprinted towards a low rise where the tufted reeds stood higher, with his teammates close on his heels. The sick percussion of Ryouma’s jutsu flared to life next to him, as another of the monsters surged under their feet. Abe’s voice rose on a strangled pitch; Genma whipped around to see a wriggling brown shape attach itself to Abe’s calf, just below his rolled up pant leg. Usagi wrapped her arms around her rookie and tried to pull him free. Kasumi’s hands blurred through seals, and a wave of water rose up at the edge of the lake between the ninja and the leeches, driving some of the monsters back. Spinning back from her retreat, Satomi unleashed a jet of fire. It blackened and blistered the leech on Abe, until the beast curled backwards and released him. Kakashi had climbed higher on one of the dead tree trunks. “Everyone out of the water, now!” His voice carried, sharp and insistent. That was what they were all trying to do, wasn’t it? Chakra pressure rose. Genma and Raidou hauled Kuroda up a slippery-barked mangrove. Ryouma shoved the brick dust red of his jutsu into the leech closest to him, then scrambled up the tree beside them. The others dragged Abe to safety in another tree. Blood poured from his leg in a cascade, staining the water beneath them. Genma’s eardrums ached with sudden pressure, and the hair stood up all over his body. In almost the same moment, Kakashi and Ginta released searing arcs of lightning. Thunder pealed so loud it shook the trunks of the trees, and the surface of the water boiled. Genma blinked the afterimages of the lightning bolts away. Where the leeches had swarmed, fat brown bodies floated lifelessly on the surface of the water. “She did,” Abe said. He was a little pale, but that could be from adrenaline. It was hard to say how much blood he’d lost, since there was nowhere for it to have pooled. “Tourniquet?” Usagi asked, already yanking one from her med-kit. Usagi shoved the tourniquet back into her kit and used her teeth to rip open the packaging on a dressing. Usagi gave Abe the second bandage, while Ryouma came up with the hydrogen peroxide. “Shouldn’t you disinfect it with alcohol?” Kasumi asked. Genma nodded and gestured for Abe to remove the bandage. For just a moment he got a look at the circular wound, but blood welled in a torrent, bright red and running unnaturally fast down Abe’s calf. It wasn’t arterial, thank the mercies. But it wasn’t going to stop without stronger measures. He flexed his fingers, rehearsing the seals for wound closing. It was an elemental medical jutsu, but if he sealed it without stemming every bleeding vessel, he’d do to Abe what he’d done to himself on the last mission, and create a bigger problem than the one they already had. Raidou slipped up behind them to wrap a blanket around Abe’s shoulders. He found the original leech bite on Abe’s arm, still dripping blood in its own right, and bandaged it. Abe grunted when she tightened the tourniquet. His lower leg slowly went pale, and after a moment, he lifted the bandages again. This time the bleeding was more sluggish, but it still wasn’t entirely stopped. Ryouma poured a thin stream over the wound. When it hit blood, it immediately bubbled and fizzed. Ryouma gave the bottle a more vigorous pour, flooding the wound, and Genma got another look at the perfect concentric circles the leech’s teeth had incised in Abe’s flesh. The worst bleeding came from the center of the wound. Probably best to work from the inside out, like he had with Kuroda’s wounds. He sent chakra flowing to his hands, flicked through seals so familiar he didn’t have to think about the order, and set the soft glow of healing chakra over Abe’s leg. “Let the tourniquet off slowly,” he said several minutes later. Abe swore softly as blood and feeling returned to his foot. At first it looked like a complete success, but beads of blood began to well at the edges of the new scabs. “Bandage it with another coagulating dressing,” Genma told Ryouma. He sat back, shoving damp hair out of his face. “Can he walk?” Usagi asked. “Better stop while you’re ahead,” Genma advised. He looked up to find that Kakashi, Ginta, Kasumi, and Satomi were picking their way among the dead leeches. They seemed to collecting fish that must have died when Kakashi and Ginta electrified the water. Kuroda and Kurenai were talking with Fukuda — or rather, Kuroda seemed to be grilling Fukuda while Kurenai listened. Blue sparks crackled off Kakashi’s fingertips and trailed through the water like tiny pilot lights, a tingly after-effect of channeling so much voltage. More glimmered in Ginta’s hair, white against gold. He couldn’t remember the last time he’d worked with another lightning user. Unfortunate that it had to be this man. Kakashi collected a brown bullnose, adding it to his string of mosquito-eaters, dartfish, and green-gilled bowfin. Judging that sufficient, he stepped carefully around Kasumi and Satomi — really, there were so many people on this mission to dislike — and avoided Kuroda on his way back to Team Six. Ryouma was putting the final touches on a neat bandage, while Abe scrutinized his work and deemed it acceptable. This faint praise had Ryouma rocking back on his heels with a quick grin, before he set to tidying up medical detritus. Abe shoved himself upright and took a couple testing steps; his injured leg held under him, so Kakashi trusted he wasn’t mortally crippled. Valid question, since the last lightning bolt had fried Kakashi’s chakra circuits raw. “I melted two leeches,” Ryouma pointed out, sounding slightly annoyed. Reluctantly, Kakashi peeled himself away and jog-trotted back up to his place by Fukuda. Ginta gave him a knowing look on the way, which he ignored after a moment’s debate about drowning the tiny lieutenant in the next leech pool. Fukuda greeted him with indifference, and Satomi with half-hidden scorn. Kurenai offered the faintest of smiles and a murmured comment, almost a compliment, on the useful way he’d helped everyone not die. The rest of the journey to Isonade Cove proceeded without incident, ignoring a minor moment of concern with a giant snapping turtle. They reached a steep, volcanic cliff edge just as the shadows were beginning to stretch long, and the ocean breeze greeted them with cool success. The descent to the beach was a relatively simple matter of chakra-walking down the cliffside, trying to avoid disturbing sea-bird nests. Ginta collected handfuls of eggs. Ryouma and Raidou had a slightly more difficult time, but only because they had to balance a turtle shell piled with butchered meat between them on a vertical plane. For water, sealed jugs sufficed. Kakashi took watch at the cave’s entrance, picking pieces of hot, fire-charred dartfish off a skewer, and listened to the surf break against the sand. In the distance, shadowed by thick mist, the tall edge of a landmass turned blue as the sun slipped down to the horizon. The sky was deep, deep red, fading to black as stars appeared, gleaming like bone chips. In six hours, Kakashi judged, they’d reach the edge of Kirigakure. One hour wasn’t long enough to rest, even if Ryouma’s surging adrenaline allowed. With the meal cleaned up and their gear packed, they gathered in little knots by the fire again, to strip down and grease up. The cool breeze off the sea turned cold. Ryouma shivered as he scooped thick handfuls of dark grease out of the jar and smeared it over his bruise-tender skin. Just beyond him, Genma was helping Raidou with the blind spot down his spine. The captain said something, in a low voice; Genma almost snickered, but held it in. His long, raw-boned hands dipped into the small of Raidou’s back. Ryouma looked away. Kakashi’d kept his tank top on again, but his legs were pale and lean under the thick coating of grease. He seemed to have finished while the others were still fumbling with jar lids. He went to the mouth of the cave, walking carefully barefoot, and stared out into the darkness. Raidou’s head came up like a hunting hound’s. Genma tossed the grease jar to Ginta. They both joined Kakashi at the rock-tumbled entrance, while Ryouma trailed behind. The tide was rising, washing higher against a narrow sandy strand. The gibbous moon lit a long silver pathway across black water, toward the massive shadow of an island on the horizon. A low crescent shape cut through the moon-path, and vanished again beneath the waves. “These are trained ninja attack sharks,” Ginta said, directly behind him. That strait probably wasn’t much more than five kilometers wide. “Stop scaring my rookie,” Genma said. Ginta chuckled. Genma looked like he was going to say something more, but a muted pulse of chakra, far down the beach, distracted them. Out in the water, another low sleek shape cut across the moon-path towards the splash. And another. “What did you throw?” Ryouma demanded. Genma clicked his tongue disapprovingly, but he seized Kakashi’s hand and towed him back into the firelight. His own hands were already glowing green. The camp disappeared with startling swiftness. Fire quenched and buried, canteens refilled, scrolls sealed. Kuroda led them back onto the beach and up the strand, until sand gave way to rock and water. No one spoke. Kakashi built Fukuda’s bubble-jutsu, but this time Satomi took the stump of her arm as they entered the water. The waves closed over their heads, and they were gone. Raidou, stony-faced, built Kuroda’s bubble. With one arm bound to his chest, the vice commander was now the weakest swimmer on the team. Raidou and Ryouma pulled him through the waves, until they could submerge in deeper water. 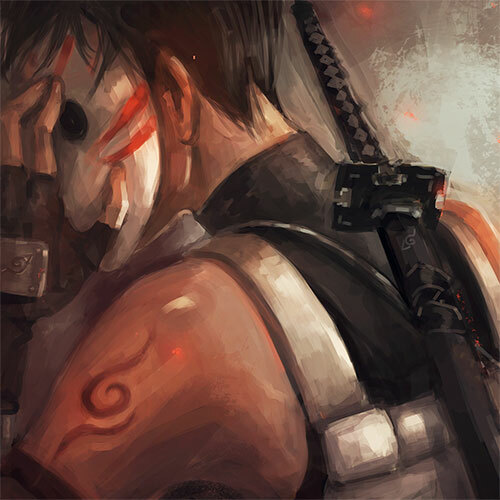 He could swim blindfolded or even blind, he realized, and he would still know exactly where Team Six was, and how the other ANBU filled in the world around him. The next time they surfaced, Kakashi and all three of the women were there, treading water. Ryouma revised his grip on the Vice-commander’s greasy arm and looked around. Gentle waves rolled around him, bobbing shinobi up and down like rubber ducks in a child’s bathtub. He could hear the crash and roar of surf, though— and there, looming abruptly close, a grey smear of cliff crowned with a dark tangle of vegetation. Aoshima. Uncharted home island of Kirigakure. Genma’s head bobbed up, sleek as a seal’s. Abe, hollow-eyed, was beside him. Usagi and Kasumi followed. Her eyes swept over all of them. She nodded, waited a bare moment for Kakashi’s bubble jutsu, and then dove. Raidou was starting to understand why Kiri-nin, as a default, were so bad tempered. If his daily commute involved sharks, cliffs, and man-eating undertow, he’d be testy too. How did civilians even get to Kirigakure? Escorted guard? Steel-plated ships? Maybe Kiri just posted a successful mission confirmation to the next of kin. Fukuda cut through the ocean like a knife, no wasted movement, and vanished into darkness. Kakashi and Satomi, with the eerie knack of Sharingan-users, had developed a comparable grace underwater, and Kurenai wasn’t far behind. With Kuroda’s weight to manage, Raidou was a lumbering walrus. On Kuroda’s other side, Ryouma looked like he felt much the same, except more edible if the twitches at dark shadows were any indication. Ginta flitted about them like a happy minnow, occasionally grabbing Raidou’s leg to tug them back on course. As they got closer to the cliffs, the waves grew more violent. Without warning, Kakashi’s ANBU spark jerked upwards, as if he’d been flung by a giant hand. Or grabbed by something. It kept rising, didn’t go out, then dropped down and forward, stretching the range of Raidou’s senses, and finally froze in place. Raidou sincerely hoped that was the cave. He tightened his grip on Kuroda’s sling-strap and kicked onward. The water surged around them, rolling forward and washing back. The ocean floor rose up below, murkily visible. Raidou’s head broke the surface; he caught a glimpse of wet cliffs, a yawning rock-fringed mouth, then the crest of the next wave knocked them down again. A hand slapped his shoulder. Ryouma’s fingers flashed through quick signs: Next one. Raidou gave a quick thumbs up. Kuroda’s good arm locked around Ryouma’s. The ocean sucked back, a wave building behind them. This time, they were ready for it. When it broke forward, they kicked up to meet it. The swell grabbed them like a handful of pebbles, and the next few moments of Raidou’s life were a dizzying kaleidoscope of sea, sky, rocks, don’t let go. Light cut out as they tumbled through the cave entrance and washed down on the other side in a chaos of wavelets and seafoam. The ocean roared, already sucking back. He scrambled to get his feet down, find ground. A hand flashed out and grabbed him by the arm, hauling him up. There was a wall, slick with seaweed and studded by barnacles. Raidou slapped a hand down on it, anchoring his chakra — found a hold. Kuroda and Ryouma landed in the same instant, grabbing wherever they could. Ginta crashed into Raidou’s back and, lacking better options, wrapped his arms around Raidou’s neck. The wave poured away. There was air again. Gasping, Raidou looked up and found Kakashi perched on the rocks above them, looking like he’d gone through the rough cycle in a washing machine. The roar returned, delivering Usagi, Kasumi, Abe, and Genma with bone-jarring efficiency. Usagi and Kasumi caught their own holds. Ryouma grabbed Genma. Abe slipped. Raidou saw his hands claw the wall, raking sea-wrack and loose stones. Felt the hooks of his chakra fail to get purchase. He fell. And like a goddamn monkey, Ginta wrapped his legs around Raidou’s waist and dropped backwards, snagging Abe by the wrist just before the sea took him. Their combined weight nearly yanked Raidou off the wall. He lurched, grip skidding — and Usagi grabbed him, then Genma. Kasumi dropped to stabilize Ginta, and Ryouma swung down to take Abe’s other wrist. “Did everyone make it?” Kakashi demanded above them. They overhanded Abe up to Kakashi and Satomi. Raidou could see now that they’d found a shallow lip to balance on. Ginta scrambled up next, giving Raidou’s neck an apologetic tap as he passed. Raidou and Ryouma boosted Genma up between them. Usagi hauled Kasumi up like a scruffed kitten. Raidou and Ryouma made it up last, with the next wave licking foam over their feet. The stone lip was barely wide enough to support them all, but it gave them a place to breathe and count limbs. Raidou’s shoulders ached fiercely, and his fingers stung with scrapes. Abe’s hands were bloody, several fingernails broken. Everyone else had an amalgamation of blue skin and soon-to-be-bruises beneath the grease — except for Fukuda, who only looked slightly windswept. Genma’s teeth were chattering. Raidou cracked his jaw, reminded himself once again that it was treason to drown a superior officer, and craned his head back. High above them, a glimmer of moonlight cut through drifts of fog. Abe was not the only one to make an agreeing sound. The look she gave him, in the fractional moment between stretching cramped muscles and swinging around to climb, was the first time Raidou had ever felt acute kinship with a Mist ninja. “You’re bleeding, Vice-commander,” Kakashi said. Kuroda’s hand went to his forehead, following the arctic grey gaze. Kakashi said, softer, “My mistake.” He hauled himself up after Fukuda, followed by Satomi, and after a tiny pause, Kurenai. Raidou exchanged a glance with Genma, whose mouth had thinned to a white line. Though, Raidou thought, possibly to hide a smile, not a lieutenant’s frown. In dribs and drabs, they scaled the cliff to Aoshima. If anyone had told Genma that the way to Kirigakure was going to involve: a boat, body grease, underwater lava caves, giant carnivorous eels, a killing field full of corpses, tropical heat with endless mosquitos, giant carnivorous leeches, chakra-sensing ninja sharks, kilometers of swimming, a geyser of seawater, sheer cliffs, near hypothermia, mountain climbing, and near death, he’d have told them to go try to scare a genin and leave him alone. Clearly the first point (boat) and the last (near death) were inevitable. But the rest? Pure BS. Except of course it wasn’t. The only good thing that had happened recently, besides Abe not falling to his death thanks to Ginta’s acrobatic save, was the stingy ten minutes Kuroda had allowed them at the top of the sea cliffs to strip the swim grease from their skin and hair, apply fresh bandages to the injured, and don warm, anonymous dark clothing. As midnight drew nearer, and they climbed higher, the country’s eponymous heavy mist chilled the air and hid details, turning rocky contours velveteen, concealing obstacles. Concealing traps. Satomi was the first to spot a trip wire, half buried in leaf litter. They had to disarm one, then another and another, until their pace felt glacial. Kuroda kept consulting his watch, glaring at whichever of them was attempting to disarm the current trap, and snapping at them to get moving as soon as the way was clear. Genma covered his snicker with a throat-clearing cough, for which Raidou elbowed him in the side. At least they were on the downslope now, both of the actual mountain pass, and of their time with Kuroda. As soon as they reached a checkpoint Fukuda had described as the last chance to not die, Usagi and her team were fanning out to create a diversion. Team Six with Fukuda would be starting the actual rescue part of this rescue mission. And Kuroda, Kurenai, and Satomi, gods help the two women, were infiltrating the famously unmapped village on a reconnaissance mission. If Kuroda didn’t make it back, there’d be plenty of possible legitimate reasons for it, and only two witnesses, both of whom were exceptionally skilled at deception. It was a comforting thought. There wasn’t much noise in the night-shrouded forest, but the occasional animal scurried by unseen, and a particularly industrious nightingale decided to serenade them. Satomi and Kakashi did most of the leading, with Fukuda between them. Ginta, who had spent his war years as a scout, was on rear guard several meters back. They’d managed a kilometer since the last trap when the bright whirring call of a quail rang out. As one, ninja flattened themselves into shadows. Genma held his breath, listening intently, until he heard what must have alerted Ginta to signal. All but the best trained would have dismissed the sound as wind in the vegetation, but there was a subtle rhythmic quality to it: the sound of human movement. Not five minutes later, a patrol of Kiri ninja passed right by them, evidently returning to the village. “Did you hear the one about the Yuki clan?” a brash-voiced man asked. Rough, callous laughter rose from the group. Yuki… Genma tried to call to mind a page in the Bingo Book, and eventually came up with a plain-faced Mist ninja, Yuki Hisuhiro, reputed to possess a bloodline limit that let him manipulate ice. The sick twist in his stomach as he got the joke was probably nothing compared to Fukuda’s. He didn’t even know what bloodline her niece was carrying, but after the horror of the sea caves, and that joke about a clan that was probably nothing more than bloodstains and bodies now, it didn’t seem such a bad idea to hurry. After several minutes, Ginta whistled an all clear, and they got moving again. This time no one needed Kuroda to urge them to keep up the pace. Fukuda’s checkpoint turned out to be a narrow slit between towering rocks, where the Konoha ninja could regroup before they separated. It was midnight now. Assuming the sun started lightening the sky around 0500, that gave them roughly 29 hours to complete the mission and get to the cove, before they’d have to find an alternate way home and risk arriving to their own military funeral. Ryouma’s mouth turned down in sullen disapproval, and he squatted to adjust his boot laces, studiously looking away from the vice commander. Kakashi, meanwhile, met Kuroda’s pronouncement with a bland look that asked what else was new. They were beginning to cluster into their new groups. Usagi and her team poured over a sketched map of the area surrounding Kirigakure, courtesy of Fukuda. Kuroda and the Intel agents had their own sketched map to work from, with much more emphasis on the buildings and streets within the village itself. That left Team Six and Fukuda herself. She pointed on the map to a broad stream sluicing down the side of the mountain. “That flows into Higuchi Aqueduct. It’s got a maintenance shaft we can use to get into the city.” It sounded almost civilized, after sea caves and swamp treks. While Raidou got the specifics from her, Genma went to check Abe and Kuroda one last time. Kuroda predictably, brushed him off after only a cursory examination of his injured arm. Which left Team 13’s rookie medic, who’d lost a senpai and survived two brushes with his own death in half a day. “You sure you’re ready for this?” Genma asked. “Those either.” Abe’s fingernails were still broken, and scabs and bruises decorated his knuckles, but he flexed all ten fingers with evident ease. Genma searched Abe’s dark eyes, but for all the trauma he’d been through, he seemed steady. When Genma turned away, he found Ginta almost right behind him. “Bet you another five hundred my team is lounging on the beach by the time your sorry asses show up.” Ginta’s teeth gleamed white in his blackened face. Now they just had to get through the middle. Team Thirteen melted away first, on a tack that would take them to the north tip of Kirigakure. Kuroda and his Intel flankers went second, rendered invisible by a skillful genjutsu from Kurenai. Team Six crouched in the silent dark for a handful of heartbeats, waiting to see whether a Kiri alarm went up. Raidou flicked two fingers. Fukuda rose, a slender traitor under moonlight, and led them down through volcanic crags to Kirigakure’s heartland. The last steps, it turned out, were the easiest. They descended as silent wraiths, every footfall carefully measured, over unmarked pathways that smelled of meat and steel and blood — hunter trails. The fog thickened protectively, just as Konoha’s trees guarded its ninja. A sheer basalt wall loomed up on them, blocking the way with black rock. Fukuda raised her hand and pressed it gently against an unremarkable stone. Chakra rippled and the genjutsu dissolved, leaving a deep V carved out through the center of the wall. Spread below them, nestled among high spurs and low valleys, a sea of lights glittered. The Village Hidden in the Mist. Kakashi let out an inaudible breath. A flutter of movement pulled his attention sideways: Genma’s hands shaping a question. Where? Fukuda pointed to the darkest side of the village, on the south edge. At this height they could only see impressions and shapes, but the pattern looked residential. Genma nodded, and turned his gaze to a tall, straight, obviously man-made structure slanting down from a mountain’s side towards the center of the village. Massive stone legs arched up to support a conduit as wide as a road, and the dull roar of pouring water made distant white noise. Higuchi Aqueduct: Kirigakure’s main source of fresh water, besides rain. Or, as Ginta had put it, a really obvious target. In any event, scaling sheer stone with only a glimmer of chakra lining each palm was a skillset Kakashi swore to practice when they made it home. Fukuda, one-handed, was secured by twin safety ropes attached to Raidou and Ryouma. They caught her more than once, puncturing the silence with soft, strangled cursing, but everyone made it up alive. The hatch into the tunnel was trapped; Genma disengaged the seal with delicate chakra work and a judicious senbon stab. Inside the maintenance tunnel was about how Kakashi imagined the inside of a storm drain: loud, wet, smelling strongly of mold. Rivulets of water trickled along the pipe’s base, made slick as grease by green scum. The journey down was mostly a controlled slide, with blind leaps over riveted joint sections. They skidded to a halt at the bottom, and waited in damp, strained silence for Fukuda to ease the bottom hatch open and signal the all clear. Kakashi studied his hands, pale abstractions in the blue-tinted dark. His pulse beat in his wrists, but his hands were steady. His heartbeat was steady. At his back, Ryouma breathed slow and even. Raidou and Genma could have been carved from stone. Fukuda tapped Kakashi’s shoulder. He dropped out, falling thirty feet to land in a low crouch. The aqueduct’s filtering station was a squat, circular building with several connected structures; there were plenty of corners to hide in. He pressed back against smooth stone. A moment later, Ryouma joined him, then Genma and Raidou at staggered intervals. If she felt anything about touching ground in her home village, it didn’t show on her face. “Stay close,” she said, then darted away. They leapt after her. She slipped like a wisp through blind alleys and snickets, leading them deeper into the warren of cramped, labyrinthine streets. There were almost no people out, which struck Kakashi as strange — even at this late hour, Konoha’s center was a lively place of young (and not so young) people out blowing off steam. Fukuda cut through shadows, or up over roofs, twisting with skilled ease to use every patch of camouflage. It was easy to follow her: ghosting through Konoha unseen was a standard jounin game. The further south they went, the more impoverished the houses became. Ramshackle buildings knuckled together like starving animals, and the rare faces they passed became thinner, desperation carved deeper than this one night accounted for. A skeletal dog lunged on the end of a short chain; Genma’s senbon cut it down before it could bark. There were rumors that Kirigakure had a three-caste system: founders, allies, conquered. It was the shinobi mined from the lowest category who graduated by slaughtering each other, and earned the worst missions for their reward. Infiltrating Fire Country with a psychopath to extract a defector and his family, for example. Fukuda took a sharp right. Ryouma slapped a building with an open palm to make the same turn, rebounding off a wall. Genma and Raidou took the roof. In the next street, a waft of raw sewage made Kakashi’s head jerk back. Giant sanitation pipes running next to the road were cracked in places, open to the air. Two more turns ended in a closed alley, so narrow the moonlight could barely filter through. Three squat, round houses leaned into each other. Two of the buildings had boarded windows. The third had drawn curtains, a door with metal reinforcements — and inside, the thin wail of a young baby. Fukuda’s composure cracked. She drew a shallow, shaking breath and pressed her forehead against the door, narrow shoulders heaving. “There’s no time,” Ryouma hissed, casting a wary look over his shoulder. Fukuda closed up like a fan, snapping herself together. She pushed back from the door and placed her hand over the lock. Kakashi opened himself just enough to feel the seedling of chakra sinking into metal. The lock fell apart; she caught the pieces before they hit the ground, set them down, and pushed the door open. Every member of Team Six jerked forward, but Fukuda simply raised her hand and caught the knife’s handle, arresting the blade an inch from her throat. Its wielder, a young woman with light brown hair and naked terror on her face, stared at Fukuda. “Hi, Kimiko,” Fukuda said quietly. Kimiko let go of the knife, flung her arms around her sister’s neck, and burst into tears. Family reunions made Ryouma uncomfortable at the best of times, and standing un-armored on a dead-end street in a village full of mass murderers wasn’t helping much. His spine itched. There was probably a two-pronged Kiri kunai aiming for it, right now. They squeezed inside. Kakashi shut the door and stood in its lee; Raidou framed the other side. Ryouma and Genma crowded together in the scant space between a lidded diaper pail and a tiny coal stove on raised legs. The raised floor of the living area was only a couple of ancient tatami mats wide. A swaddled infant lay on its back on a rumpled quilt, crying fitfully. The dull yellow glow of a paper-shaded light bulb revealed Kimiko as a painfully thin young woman around Genma’s age, missing two fingers at the first joint of her left hand, with exhaustion-bruised eyes and milk-swollen breasts. She wore a faded sleeping yukata, and her hair hung loose and tangled around her shoulders. She stepped back to lift her child up from the bed, and turned again. For the first time, she seemed to notice the four men standing near the door. Her eyes fled from Raidou’s muscled shoulders to Kakashi’s mask, and her arms wrapped convulsively tight around her baby. She started to shake. Kimiko took a shaky breath, and another, as if her white-knuckled grip on her swaddled child could translate into a new grip on herself. The baby’s fretful cries had begun to take on a new pitch of distress. She shifted the child up to her shoulder and patted its back, swallowing hard. “I need shoes. Clothes. I— Sango has a toy monkey. She won’t sleep without it.” Her eyes fell to the floor, scanning past Genma’s feet. Kimiko stared at him. Ryouma had seen that same glassy-eyed look on animals caught in a snare: too frightened to fight, too exhausted to run. She nodded, finally, but she didn’t move to take it. Fukuda looked at him, sharply, then reached out to wrap her arm around Kimiko’s shoulders again. She drew her sister down to sit on the edge of the tatami floor, murmuring softly. Kimiko didn’t relax, but after a moment her head tipped towards Fukuda’s, brown against blonde. Cool fingers rested on his arm, just for a moment. Genma said, “Diapers, clothes, shoes. I’ll see if I can find a rucksack. You start assembling the baby stuff.” He pointed at a thin cord that cut diagonally across the corner near the coal stove, strung with heavy white cloths. Diapers. Right. Not bandages. Ryouma shook himself, and went to pull them off the line. Diapers, monkey, a cloth for wiping soiled bottoms, a few tenderly stitched tiny outfits, swaddles— What else did babies need? There wasn’t much else in the house. Ryouma knew poverty, bone-deep: hunger that gnawed at the spine, fear that sank into the belly. The exhaustion that pulled you down, promising tomorrow would never be better than today. He’d bargained for his freedom with his blood, but Kimiko had tried and failed and sunk back down. Those maimed fingers would never hold a kunai. He wondered where the father was. Dead already, like the Kusakabe clan in the caves? In hiding, or fled? It didn’t really matter. The kid would grow up with her mother and aunt anyway, in a better place than here. He was rigging a piggyback sling out of rope, padded thickly with torn pieces of quilt. Ryouma stuffed the rest of the baby paraphernalia into Genma’s rucksack and crouched down to help Raidou knot, adjust, and pad the sling. Kakashi stood guard by the door, silent, watching. A sling for the baby went a little quicker; Kimiko had one already, a sturdy cotton wrap that Kakashi eventually stepped in to decipher. He tied it around his own torso with a memorized ease, then peeled out again. With the sling in his hand, he crouched in front of Fukuda and Kimiko. Kimiko looked instinctively at her sister. Fukuda hesitated, her eyes on Kakashi’s face. “I have a little brother,” Kakashi said. His voice was low and steady. “He’s three and a half.” He looked at the child in Kimiko’s arms and reached out carefully, signalling every move, to lay a finger across her palm. The baby snuffled; the tiny hand curled closed. Kimiko’s eyes drank him in. Her arms tightened on her daughter, clutching her closer; then, with an effort like breaking bone, released. She flipped back the swaddling quilt. Ryouma nearly bit through his tongue. For a heart attack second, Kakashi thought, Dead child. But the hand wrapped around his finger was strong and warm, and the little girl was breathing. She was just— blue. A deep, dusky blue that started at her torso and spread out, fading to feathery grey along her arms, legs, and neck. Only her face and hands were pink. On either side of her throat, three fine lines ridged across the skin. Well, it wasn’t like he’d expected a civilian. There were stranger kekkai genkai in the world than primary colors and gills. Ryouma was still staring at the baby in alarm. “Uh—yeah. Here.” He shook himself and handed over a blue sleeper onesie, stitched from threadbare flannel. Ryouma had to rummage for a moment, but he eventually produced a purple knit cap. Kakashi tugged it onto Sango and installed the little girl in the sling. She tolerated the treatment with a small amount of fuss, but didn’t scream at the manhandling stranger. He double-checked the sling’s security, then got back to his feet. The familiar weight against his chest, surprisingly heavy for such a tiny thing, made something briefly wistful curl up through his ribcage. Kimiko didn’t look exactly hopeful, but she didn’t look terrified, either. And she ate the ration bar. The next several minutes were filled with rapid sorting and packing. Kakashi retook his position by the door, standing guard and staying out of the way in equal measure. Fukuda helped her sister dress in warm clothes and sturdy shoes. Raidou and Ryouma were directed to collect a few precious knick knacks — a grandmother’s quilt, a pair of bone-china sake cups, a hairbrush — while Genma prepared a sealing scroll. At some point in the production, the bedraggled yellow monkey found its way into Kakashi’s hand. He tucked it in the sling; Sango grabbed it and stuffed the tail resolutely in her mouth. Then — silence, a muffled shiver of chakra, and they were done. The tension in Fukuda didn’t relax, exactly; it found a new target. She hugged her sister, one-armed and hard, pushed her towards Raidou, and lifted a challenging gaze to the Konoha ninja — particularly Ryouma. Her eyes were a lighter ice-chip blue than her sister’s, but they said clearly enough: You think we can’t love our families too? Ryouma’s mouth whitened. He looked away first. It seemed much longer. But finally Kimiko was in place, tied to Raidou’s back with the makeshift harness holding her under the legs and around the shoulders. Her hands clenched white-knuckled into Raidou’s shirt. Ryouma had settled into place behind Kakashi, restlessness making his fingers twitch. Genma angled his head to the north wall. And outside, something in the north exploded.